If I can only choose one kind of fish to eat in my life, it would be salmon. Salmon is full of vitamins and minerals, besides it provides a healthy dose of omega-3 fatty acids to our body. In our modern diet, omega-6 fatty acids are in everything and especially high in processed food and fast food. Consuming too much omega-6 fatty acids will have an adverse impact on the amount of omega-3 fatty acids our body can take in since they compete for the same enzymes needed for digestion. 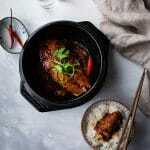 Maintaining a low ratio of omega 6: omega 3 has been shown to be associated with decreased risk in many inflammatory diseases, cardiovascular diseases and cancer. In my case, adjusting my diet from a high ratio of omega-6: omega 3 to a much lower one has done wonders for my skin. Reducing added sugar and processed food and eating seafood regularly improve my skin a lot. Therefore, seafood including salmon has been an important part of my diet. 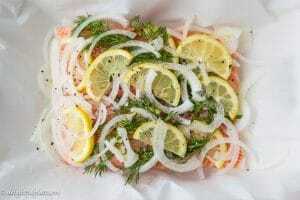 There are so many ways to cook salmon but my most favorite method is slow cooking it at low temperature in the oven. Though this method takes more time, it doesn’t require constant attention and more importantly, it results in a melt-in-the-mouth texture. 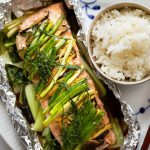 The salmon is moist, soft and silky and I can even eat two servings of this slow baked salmon easily. This slow-baked salmon is pretty light in flavors. 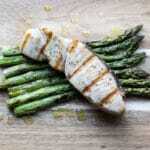 If you like something more flavorful, I recommend this ginger salmon in foil packets recipe. Preheat oven to 350 F (or 175 C). Massage the salmon fillets with about 1 teaspoon olive oil and sprinkle salt and pepper generously over them. Set aside (it's best if you can give them enough time to come to room temperature). Trim off the top and bottom of the onion, then cut in half lengthwise. Slice into thin half-rings. Quarter the lemon. Slice 3 of the lemon quarters into thin slices. Place a big piece of parchment paper over a baking tray. 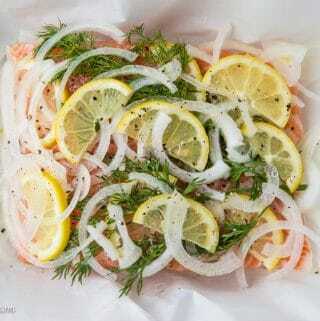 Spread a thin layer of onion half-rings on the parchment paper to create a bed for the salmon to sit on. 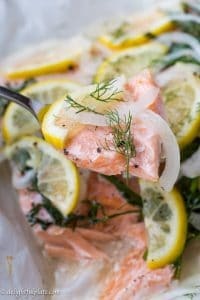 Place the salmon fillets on the onion bed, then place dill, lemon slices and the remainder of the onion half-rings on top of it (see image below). Sprinkle salt and pepper. Squeeze the last lemon quarter all over. Fold the edges of the parchment paper to seal the package and then put the baking tray into the oven. Bake for about 30 minutes (more or less depending on how thick your fillets are). 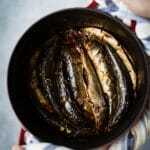 Remove from the oven and serve with more lemon.